Jennifer Chiaverini's new book, The Wedding Quilt will be out in book stores tomorrow. I'm not sure where this postcard came from, but I received it in the mail a few days ago. It reminded me of the time that Jennifer came to speak at our Dear Jane retreat up in Shipshewana, Indiana, so I thought I would share a few photos with you. 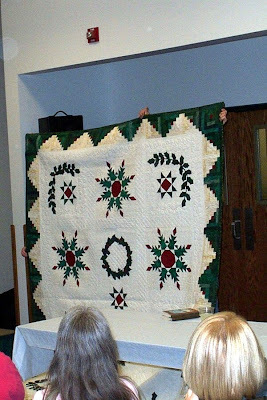 In December 2005, Jennifer's book, The Christmas Quilt had just been released. A lot of us had read it as well as her other books. She told us what it was like to be an author of not only her fictional works but also her quilt pattern books and to design fabric lines for Red Rooster. After she spoke for awhile, she finished the evening reading to us aloud from The Christmas Quilt. You could have heard a pin drop. It was a perfect evening complete with a light dusting of snow on the ground. This is the Bergstrom Christmas quilt. The Delectable Mountains quilt is referred to in The Sugar Camp Quilt. And, it was a thrill to see Sylvia's Bridal Sampler. At the end of the evening, Jennifer autographed our books and posed for pictures with each of us. She answered questions until there were none. She was most gracious, and I'm so glad to have been part of that evening. Notice her jacket is made from her fabrics. I finished putting the last stitches in the binding on this table topper last night. This is one of the Flower of the Month series from Northcott. I'm not sure which month this is, but I'm sure it's one of the summer months. Here is a different photo that is more muted, but I think you can see the machine quilting better. This quilting design is one that I found in one of the 365 days of quilting by Leah Day. And another picture of my feet. Hope you are stitching today. Thanks for coming by for a visit! First of all, I want to thank all of you for your kind comments on my last post. I am feeling much better each and every day. I really appreciate your concern. I haven't felt like doing much machine sewing, so I've been stitching on a few more Trick or Treat Baskets from the book When the Cold Wind Blows by Barb Adams and Alma Allen. 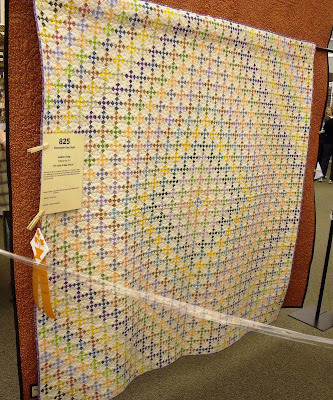 The original quilt from the book has 300 of these baskets. I haven't counted how many I have, but I don't think I'm even close to 100 yet. Jeanette, one of the gals that comes to our Dear Jane retreat has finished her basket quilt, and you can see it here on the Blackbird Designs blog. I just love looking at these basket quilts, and hers is gorgeous. Here is what fall looks like in my back yard. I love walking around the yard and listening to the crunch of the leaves. This is my favorite time of year. This is my Granny Stripe Afghan that I'm doing as part of the Granny Gone Wild Crochet Along. You can read more about the crochet along and this pattern on my crochet blog. You can see photos of the crochet along on the Flickr site here. Hope all of you are finding some time to stitch or crochet or knit today. I usually don't write anything medical on my blog because I want this to be a happy place to see quilt and yarn projects. But, yesterday I spent the morning in the emergency room after having some problems and passing out here at home. They are pretty sure that I passed a kidney stone, and there will be more poking and proding to come this week. But, there is a quilt connection in all of this. This all started before 8 am yesterday morning, so my husband went to the cafeteria to eat some breakfast. When he came back he showed me his cell phone. He had found a quilt and taken a photo. So after I was dismissed we went back so I could see the quilt. 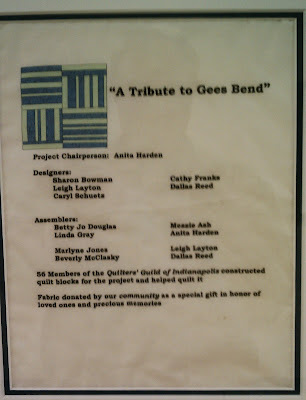 It turns out it was made by several Indianapolis Quilt Guild members. 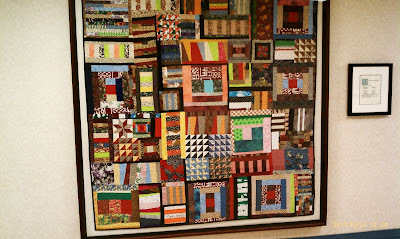 Some blocks were quilted in big stitch with perle cotton and others were machine quilted. I'm glad that I was able to see this work of art. Fabric donated by our community as a special gift in honor of loved ones and precious memories. 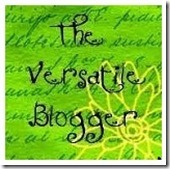 In the last couple of weeks I have received the Versatile Blogger Award from two of my readers. When Marta gave me the award I linked back to one of my posts last January when Staci http://theconfusedquilter.blogspot.com gave me the Stylish Blogger award. All of these awards ask that you tell 7 (or 8) things about yourself, so since I've gotten the award twice just recently, I decided to put the 8 different things about myself here for you to read. 2. I went on my first date with my husband on January 18, 1973, and we were married May 19, 1973. That was a short courtship by most people's standards, but it was right. We were married 38 years this May. 3. I have two grown children; both of them are amazing people. My son composes music and to date has about 50 published pieces, and is music minister at their church. He also works part time in an elementary school media center. My daughter has a degree in Mechanical Engineering and Math and will soon have her Masters Degree in Statistics. She worked in Alabama for 2 years, and now she is at Purdue and is almost finished with her Master's Degree in Statistics. She played with the Purdue handbells last semester. Both of my children are musically inclined, and their Dad and I can barely play the radio. 4. I taught ESL (English as a Second Language). That was an interesting job. People ask me how many languages I know. I know just enough Spanish to ask for a drink of water and for directions to the restroom. Well, ok, I know a little more than that. I love it when my Spanish speaking blog readers leave me a comment or send me an email totally in Spanish. I do my best to figure out what it says before I cut and paste it into Google Translator. If I ever post a tutorial and you feel like I am explaining it as if you spoke a different language, this is why. It was a habit for several years! 5. I've quilted for 16 years or so. Before that I made a few hexagons, but had no idea what fun it would be to learn so many different quilting techniques and just how many good friends I would make along the way. 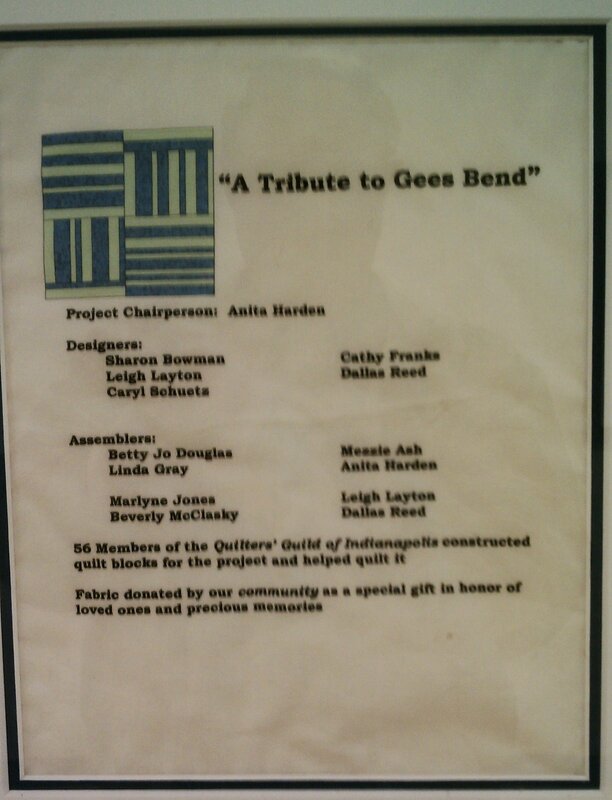 Last year I entered a couple of my quilts in the Indiana Heritage Quilt Show held in Bloomington, Indiana. I was awarded a ribbon for Judge's Recognition. I had never entered anything in any quilt show before-not even a guild show-so getting the ribbon was quite a thrill. 8. I love technology. I almost didn't get a convection oven because I thought I wouldn't be able to figure out how to cook with it. Boy was I wrong about that. I love my Droid phone, and I'm finding out new things about it every day. But, if you are still reading my deep, dark secret is that I love video games (and some computer games). When the Wii was just coming on the scene, I had sold a bunch of collectibles on EBay. I took part of that money and stood in line at Fry's Electronics before they opened one morning when I knew the new shipment was coming in so I could buy a Wii. I claim that I got it for the Wii Fit so I could exercise....oh really? I got it to play Mario Kart, and I love Guitar Hero. I even have 2 guitars in case anyone comes over and wants to play. If only I could play games and quilt at the same time. There are so many great blogs out there that I find it impossible to pick just 15. One of my favorite things to do while blog surfing is to go to a new to me blog of someone wholeft a comment on one of my regular blogs. I just love seeing what everyone is working on and what fabrics they are buying. I really appreciate all of my followers and those of you that leave comments. I try and get around to visit all of you if there is a link back to you, and I try my best to respond to your comments whenever I can. Thanks to Marta and Raweyn for reading my blog and giving me this award. 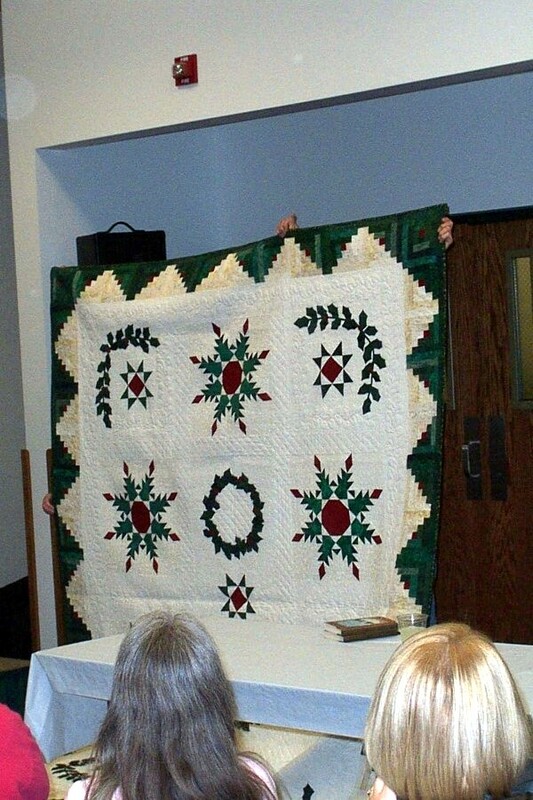 I know with all of the quilts that some of us have, we are always looking for new and unique ways to display our quilts. This little lady was standing in the corner of our mountain cabin. A chaperone maybe? That is the kind of chaperone I would like...one who would stand in the corner and keep quiet. I didn't have a thing with me to use to measure her, but I wanted you to see this idea of how to display a quilt. The quilt is gathered around the neck with a pipe cleaner (or you could use any sort of rope or cording) to match the background color of the quilt, and then a small silk floral arrangement is tucked in at the center. As you turn her around, you see that she is fashioned on one of the metal easles that are used in the cemetery as a way to display a wreath. Most people wouldn't know and neither would I if I hadn't turned her around to see how she was put together. These easels are pretty inexpensive and can be found at several craft stores. The quilt is tied around her neck and the ends of the quilt droop to make the arms. I think it would require some work to get the quilt arranged just right, but I thought the idea was clever. After it rained one afternoon, there was a rainbow over the mountains. I enjoyed my visit to The Cherry Pit quilt shop and bought a nice little bag of goodies. Then I found a comment on my blog from Linda, The Quilted Pineapple, telling me that Machine Quilting by Iva's quilt shop was not to be missed, and she was right. This is the view from the door. Linda mentioned that there were lots of pre-cuts. I could never have imagined that there could be so many charm packs, jelly rolls and layer cakes all under one roof. And there were more pre-cuts on the next aisle. At the far left you can see they were on both sides of the aisle. This was one of the separate rooms. You can see more pre-cuts. There were more in this room that I didn't photograph. More fabric and patterns with lots of samples. More fabric. I love the fall table topper in the lower part of this photo. I bought the pattern for it. A different view into that same room. There were buttons, more patterns, and some small quilt hangers. Here is a close up of the cross stitched pillow behind the cutting counter. And....I have no shame. 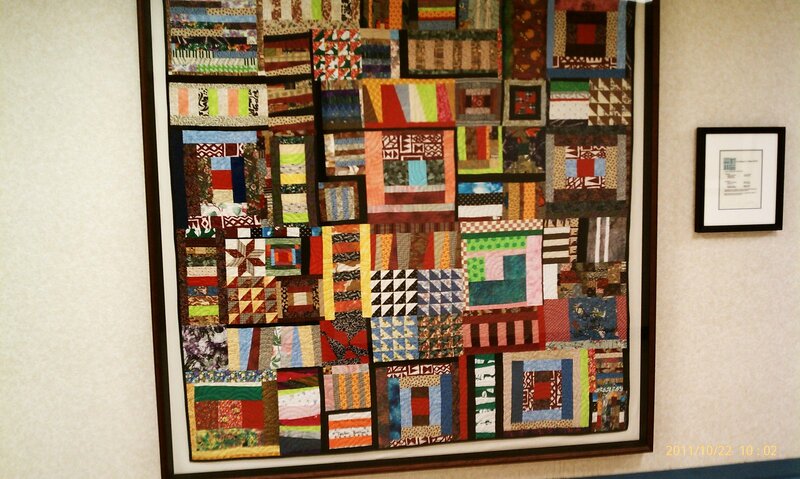 This lovely quilt is hanging in the bathroom. I used to have a piece of that batik in the border, and I just love what they did with it. The quilting on this quilt is just gorgeous. Iva has a long arm machine at her home and does quilting there. These guys were standing in the corner. Even the bathroom had lots of eye candy. This is what Machine Quilting by Iva's shop looks like. I mentioned that it would be nice if they had a web site, and they said they plan to work on one soon. In the meantime, they told me that they would be glad to ship anything so if you are looking for something, just give them a call. After looking at these photos, I realized that I didn't take photos of the 2 rooms that were on the opposite side of the store. Thanks to Iva for allowing me to take these photographs to put on my blog so you can see the inside of her shop. One day after it rained I looked out and saw this rainbow over the mountains. Hope you are finding some time to stitch! Here is my little bag of goodies from The Cherry Pit. From the comments I received, a lot of you know right where the shop is and have either visitied and shopped there or are involved in one of their Block of the Month programs. There was a lot to choose from. I love using charm packs so I bought 2 Sophie and 2 Butterscotch and Roses. I also bought 1/3 yards of 3 pieces of the Sophie line. I wanted to bring home one of the Pit Designs patterns from the store, so I chose the Autumn Banner. At first I had 5 of the tea towels picked up for purchase but decided that was a bit ambitious, so I bought just one and 2 of the large spools of quilting thread. I came to my senses at the last second and remembered I was trying hard to finish up some UFOs before I left home a week ago. I bought the magazine at Wal-Mart when we went in to buy a new mouse for my laptop because my other one died. There was a shop sample at The Cherry Pit that looked quite a bit like the cover quilt on this magazine. They had used batik scraps in their quilt, and it was gorgeous. I love this scrap quilt, and it looks easy to cut and put together. You are probably tired of mountain photos by now, but here is an early morning photo of the fog lifting before the sun comes up. I would never tire of this view. I hope you're finding some time to stitch today!